Nothing relaxes as well as a nice soak in a warm bath especially when that warm bath has an herbal bath fizzy in it. These are another great gift idea from my kitchen. 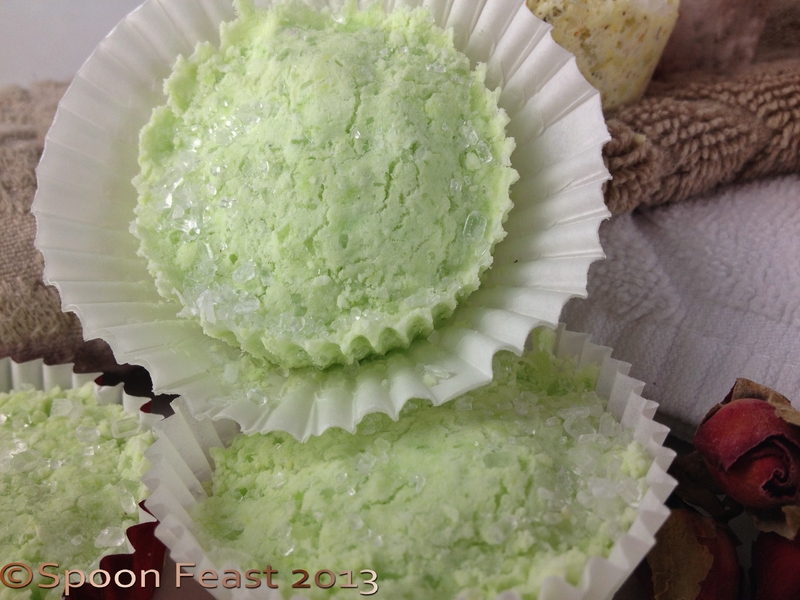 They are fragrant, pretty and very easy to make. The hardest part is waiting for them to dry. That and not using too much liquid. 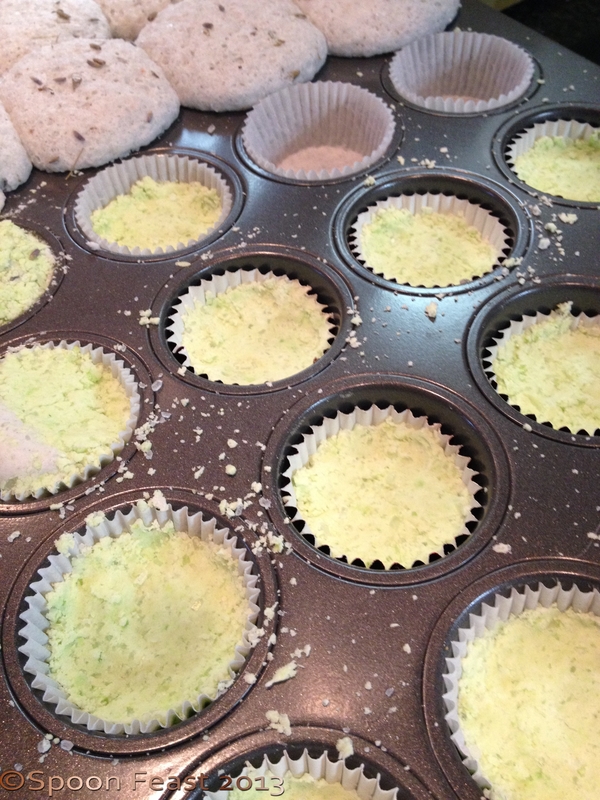 This batch recipe makes 8 fizzes the size of mini cup cakes, in fact I use a mini cup cake pan to set them up in. You can use paper liners if you like. If not, be sure to lightly oil the pan so the dried fizzes come out without too much trouble. You can always use any crumbles by the handful in the bath too. 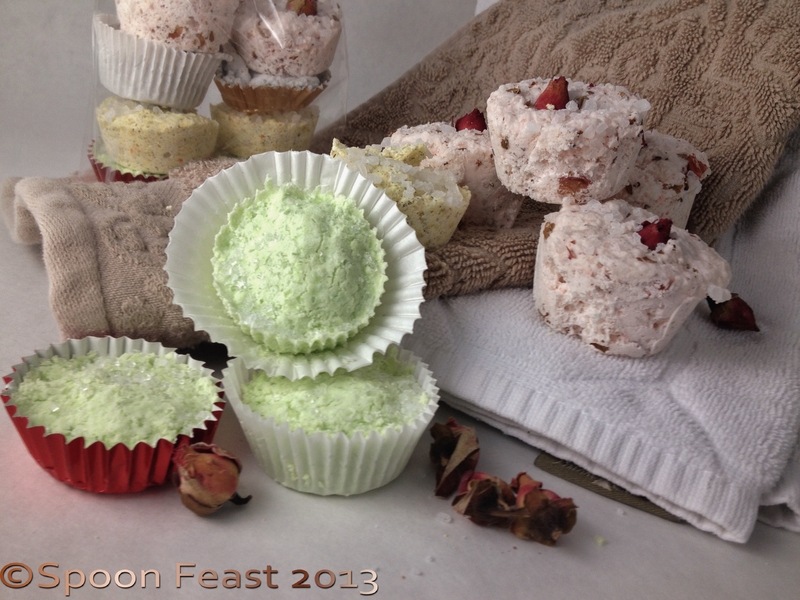 Powdered green tea, chamomile tea, fine-cut herbs and citrus zest, rose petals, flower petals. Leave flower petals large so they don’t fit down the drain. Just remember, you don’t want to clog a drain. In order to be successful making these, you need to understand the science behind what makes them work. 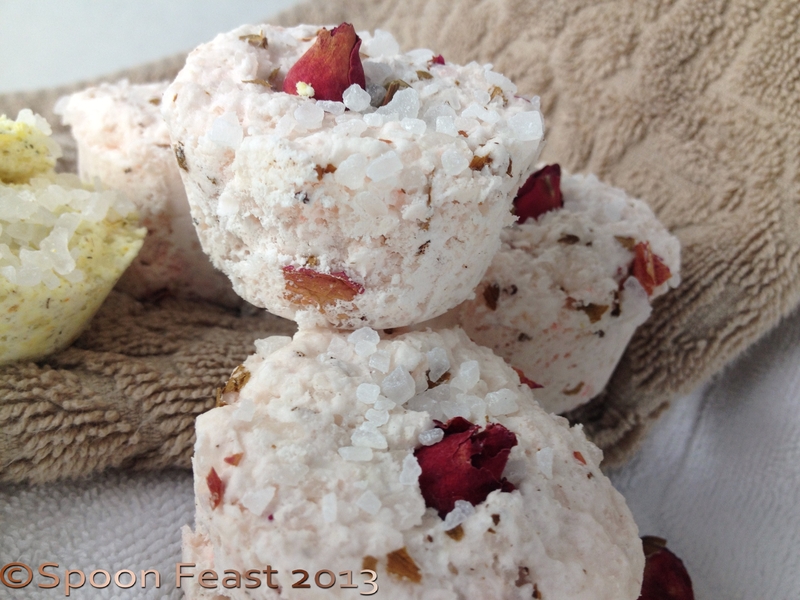 When the Herbal Bath Fizzes work, they float around the tub fizzing away like a big Alka-Selser until dissolved. Once dissolved, they leave behind a rich bath full of minerals, skin softeners and stress relieving aromatherapy. Remember making the volcano lava as a child? You know, mixing the baking soda with the vinegar that produces a huge fizz that rises and flows spending the fizzy energy quickly, depending on how much baking soda you had. Well basically that’s the same principle here: add the baking soda to an acid, (citric acid), add liquid and watch the fizz begin. So there lies the trick. The fizz is supposed to happen in the tub. 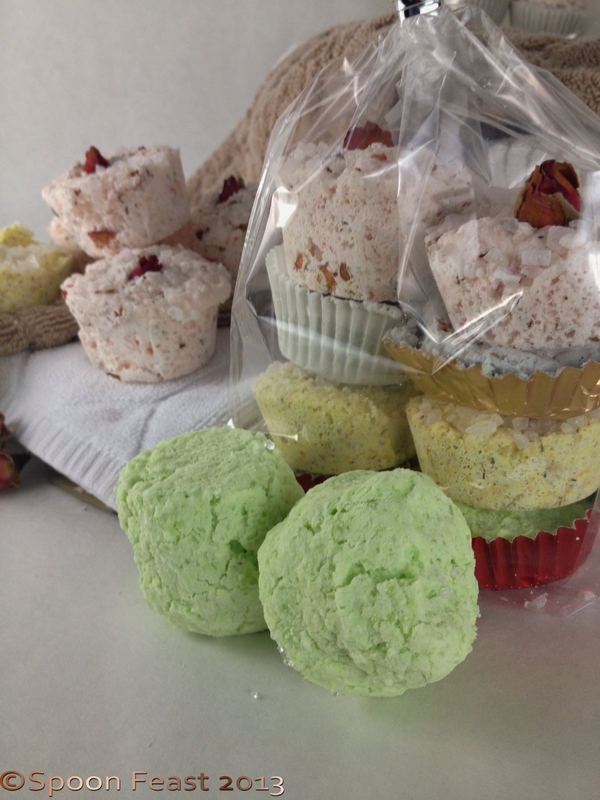 If you add too much liquid to mix the bath fizzes together, they will rise like cupcakes, from a flat batter to a full-blown overflowing, catch-it! mess. Whats the secret? Add only the smallest amount of liquid, only enough to hold the mixture together when it is squeezed together with your hands. Why? Because it is the liquid that activates the citric acid by liquefying the citric acid and thereby providing an acid base for the baking soda’s reaction of mass expansion. Only use the bare minimum liquid. Measure as directed but only use a tablespoon. I find the liquid is enough for two batches. 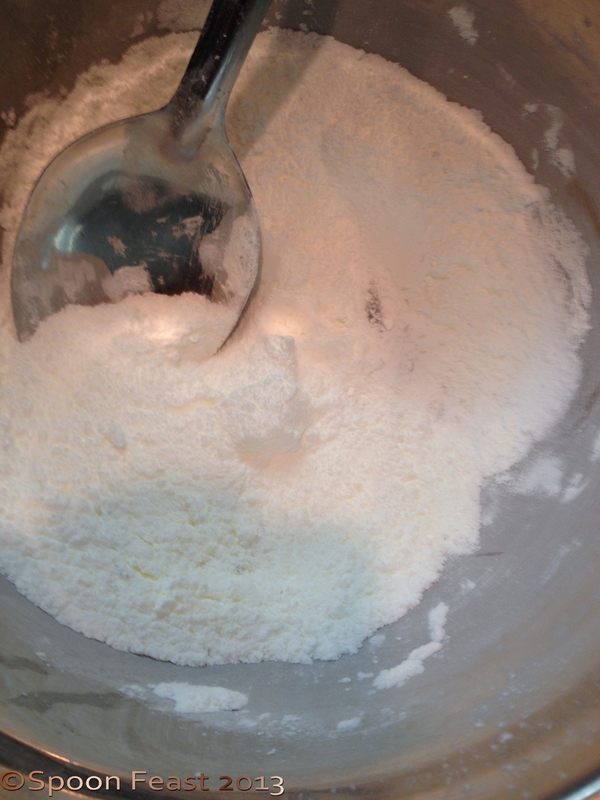 Mix the dry ingredients together, making sure there are no lumps. 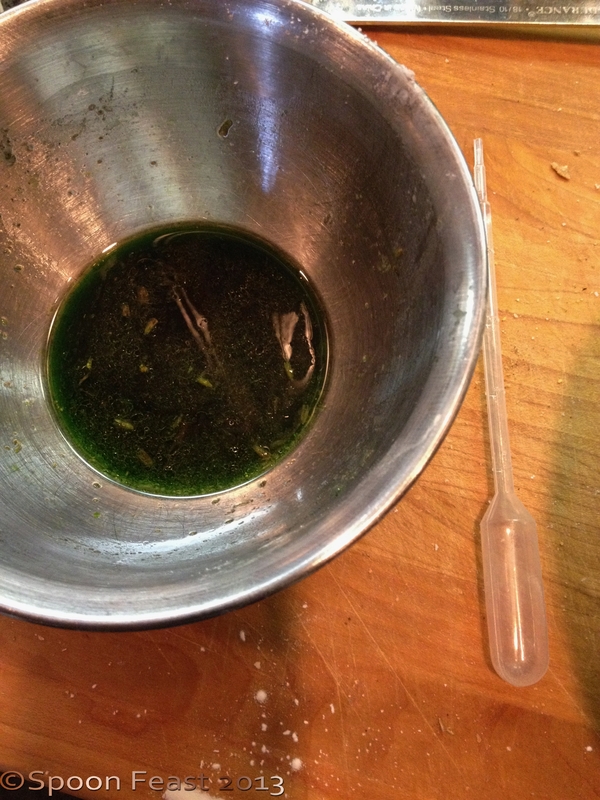 Mix the oil and liquid in a separate bowl. Add 20-30 drops of your favorite fragrance, 1-2 drops of food coloring in a small bowl. Use a plastic pipette to measure the drops. Stir it then measure out exactly 1 tablespoon and drop it into the bowl of salts and minerals (the dry stuff) you just mixed without lumps. 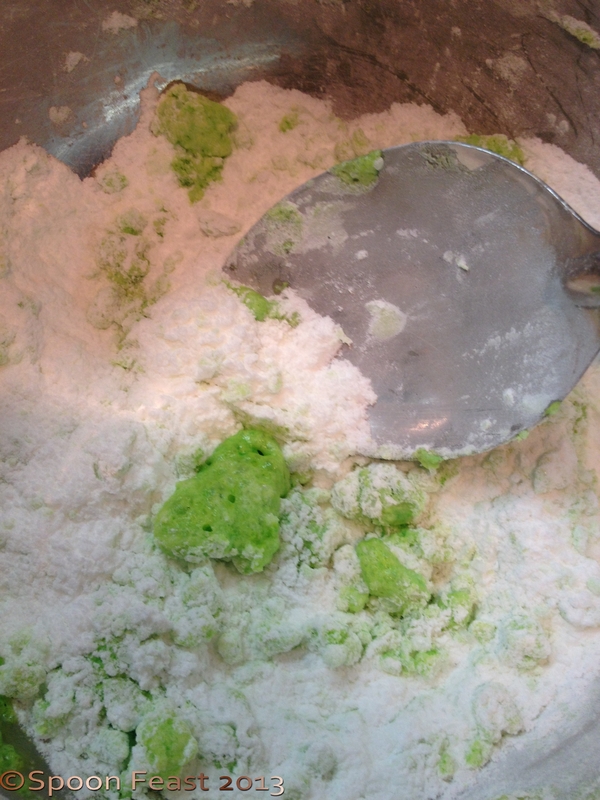 The first thing you will notice it how it poofs as the liquid hits the powders. Stir quickly with a spoon to incorporate the wet with the dry, use your hands to mix the final stage and give it a squeeze test. Watch it puff! Stir quickly to incorporate. Don’t use too much liquid! If the mixture even holds together a little bit, its good to go. If it is a bit dry and won’t hold together, sprinkle just a few drops over the surface and mix again with your hands. Give it a squeeze test, then mold it up. Press mixture firmly into molds. Notice how much the batch in the back has puffed! They kept going and going. . . When filling, only fill 2/3-3/4 full and press the mixture in very firmly. Always allow room for some puffing. Hopefully it will be a minimum. If you added too much liquid, you will notice they will start rising, and keep rising. I’ve taken half the mix out of risen cups before and doubled the number I was trying to make, then pressed everything back down into the cups again. Only to find they rose wildly again! After wrestling them back into the cups again, I learned to keep an eye. The problem with them puffing while trying to dry, is that all the puffy gas gets spent so when it hits the water in the tub, instead of getting all fizzy-like, it just melts leaving all the goodness behind. It still has all the great benefits, just not much of a show. Any broken bits or crumbs can be collected and put in a jar to sprinkle into the bath by the handful. I like to take deep hot water baths so I use two, sometimes three of these. I love them and so will anyone you give them to, including yourself! Packaging: Wide mouth canning jars, tins with see through covers, see-through ‘paint cans’, baskets, cellophane bags with ribbons, single acetate bags with adhesive sealing, boxes, Chinese take-out boxes. There are so many ways to package these fizzy gems! Just another gift idea from my kitchen this year. Robert says he wants to get a cup of tea and eat one. I told him he would be in for quite a surprise! This entry was posted in Fun Crafty Things, Natural Body Care, Recipes and tagged bath fizzy, bath salt, Citric acid, Epsom, Essential oil, Magnesium sulfate, Sodium bicarbonate, spa treatments, Tablespoon, Tea. Bookmark the permalink.